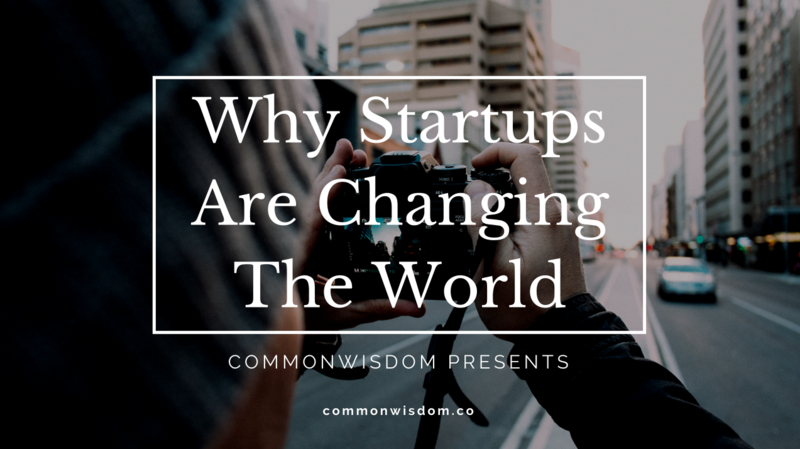 Startups are now the change engines of the world, but why is this so? The answer lies in the speed of change triggered by technological advances. Think of the jump from the world of radio, to the world of television. During the age of radio, people spent time by listening to music, stories, news and early formats of talk- shows. The capabilities of the days’ technology were utilized fairly efficiently. When the television came around, although the technological capability was now much higher (allowing the transmission of images and opening up the space for visual storytelling) the early content remained very similar to those in the radio days. People would gather up around a table. They would read through the stories with texts and notes in front of them, as if they were in a radio show. The camera would generally be motionless. Although the audio content was interesting, the visual content was static. Only in time, the visual content has started catching up to the technical capabilities of television. Slowly it started using “visual storytelling” to its full potential. The same logic applies to every other technological leap. Take the introduction of live broadcast, computer graphics, ubiquity of self owned cameras, online video hosting, smartphones and others. The point is; each time technology makes a leap, it opens up huge areas of possible innovation and value creation. In the last 50 years, we have arguably seen bigger and bolder technological advances than we have experienced for the totality of our existing history. Which means, the new space that has now been opened up, is at an historical high. And new products, services, solutions, innovations and most importantly with new technologies will inevitably fill that space, perpetuating this cycle. This new space is the playground of startups. Their mission is to collaborate to try to create value in untried ways, fail fast, learn, try again and repeat the cycle. In a sense, each startup can be seen as a living organism mimicking an evolutionary natural cycle. Nature’s best tool is its ‘mistakes’. What is a mistake but a variation (or a ‘pivot’ in the world of startups)? If there were no mistakes in the replication of the DNA, then there would be no variation, no adaptation and no evolution. With no mistakes, the evolution machine would not work. This is the same with startups, with no mistakes, the startup machine does not work. It is the age of Digital Darwinism. Clayton Christensen, the author of Innovator’s Dilemma likens companies to living organisms, too. He points out that each company has a lifecycle, it grows, matures and dies. Usually, the lifecycle of an organization can be observed in parallel to an important technology that is central to its functioning. What Happened to Kodak and Nokia? For Kodak its print photography, for Nokia it is mobile voice calls. We stopped printing photography and start sharing it through our smart phones and data. This brought the fall of Kodak and the rise of Instagram. As our need for mobile internet grows, we see the fall (or radical restructuring) of Nokia and the rise of Apple, Samsung and others. Christensen argues that although its possible, as in the case of IBM making the leap from mainframe to personal computers, it is very rare to see a large company that has been able to successfully jump from one technology to the next. For large companies, investing in radical innovation when their traditional business is already profitable, is a risky and insane-looking move. Moves that diminish short or mid-term gains in favor of potential future increases are hard to justify in big organizations and especially with public companies with many stakeholders. What ends up happening is this; large organizations either defer or under-prioritize innovating (filling in the spaces opened up by new technological leaps) until they absolutely need to. In most cases, that turns out to be too late.